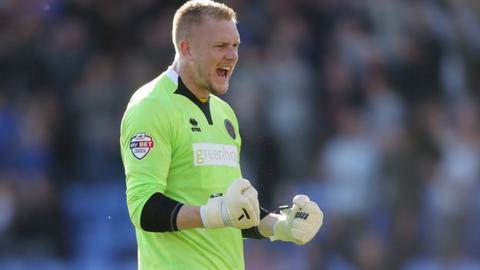 Shrewsbury Town stand-in goalkeeper Mark Halstead hopes he has done enough to earn a run in the first team after waiting over a year for his first league start with the Shropshire club. Halstead, 25, has started the last two games after the loss of first-choice Jayson Leutwiler with a back injury. "I've just got to concentrate on doing what I do," he told BBC Shropshire. "I've been waiting for a long time, for one reason and another, and I've finally got my chance," added Halstead. "Now it's down to me to take advantage of it and hopefully play my way into keeping the shirt. "I firmly believe that, if I do well, the manager will stick with me. I've just got to give him a difficult decision for whenever Jayson is fully fit again." Shrewsbury stand 16th in the table after their first away League One defeat this season - just three days after ending their winless league run at home. Halstead, signed in June 2014 from Blackpool, made just two appearances last season, both as a second-half substitute for Leutwiler - and he admits that he has since been the subject of interest from a couple of League Two clubs. Leutwiler's back injury then saw him included for Saturday's 2-0 win over Blackpool, when he kept a clean sheet against his former club. It did not work out so well at Rochdale on Tuesday night when Shrewsbury found themselves 3-0 down in 15 minutes, Halstead was booked and had a post-match confrontation with a fan. But Town did come back to only lose 3-2 in the end and manager Micky Mellon publicly absolved his keeper from any of the blame for defeat. "It's a bit unfair to call Mark second choice," Mellon told BBC Shropshire. "He has all the attributes of being a number one. It's not a dilemma for me. It's a dilemma for Jayson Leutwiler. He's got to win the jersey back."